ow did the Vikings want to be perceived--by other members of their own culture, and by posterity? It is not an altogether easy question to answer, for unlike many of the peoples they traumatized they were still pagan in the early stages of their story and therefore to all intents and purposes illiterate--in the Europe of the early Middle Ages writing was an accomplishment that came with Christianity. But the question is surely worth pondering, and it has the advantage of making us take a new look at our medieval sources. Our fullest information about how the Vikings wanted to be remembered probably comes from later medieval Scandinavian accounts that saw them as inhabiting a kind of heroic age. These are mainly contained in thirteenth- and early fourteenth-century prose sagas composed in Iceland. In themselves, these sagas wouldn't be able to help us much, for although they surely drew from traditions that were passed down orally over the centuries, they are also products of their late-medieval writers' interests and preoccupations. But they also often contain poetry they claim their heroes actually composed, and there usually seems little reason to doubt the claim. In what follows I will accordingly start thinking about how the Vikings wanted to be perceived by referring to some of this poetry. I will confine myself to what is generally considered the very best of this poetry, which comes from an outstandingly successful Viking by the name of Egil Skallagrimsson (ca. 910-990). The poetry that Egil and his peers specialized in--scaldic poetry, as it is now termed--is most importantly praise poetry, designed to commemorate kings and other prominent people, often in the form of quite long poems. But it also often treats exploits of the poet himself, this time in extempore single verses commenting on specific situations, and always in a highly self-congratulatory tone. It is extremely complex metrically and it uses a highly ornate metaphoric language--its complexity presumably helped ensure that it would be remembered even in an age that was for all intents and purposes without writing. But because it is so concerned with praise, it can tell us a great deal about the qualities the Vikings themselves held dear. We mainly know of Egil through an Icelandic saga bearing his name, Egil's Saga, again one of the very finest of the sagas. His family, like very many described in the sagas, had been forced to emigrate from Norway because of an ongoing feud with the family of Harald Finehair. Harald was a once petty king who violently consolidated Norway's several power bases into a single kingdom--sometimes, it seems, by simply hacking people's arms and legs off (Egil's Saga, ch. 4). He was originally known as Harald Shaggyhair because he had vowed not to cut his hair until he had performed this consolidation; as things turned out, he had a fine head of fair hair. Egil is certainly no prototype of the kind of poet we think of in our post-romantic age. But he was outstandingly talented, and he realized as a child that it would be an important part of his cultural persona to be able to compose the poetry so valued by his society. He also genuinely loved poetry: we learn that in his later life he greatly enjoyed discussing poetry with other poets (ch. 78). And he must have worked very hard at acquiring the requisite skills, although we do not hear much about this. Even in his own time he seems to have been universally recognized as unequaled as a poet; it was an assessment he himself thoroughly agreed with. By all accounts, not least his own, he started composing poetry exceptionally early--at the tender age of 3, to be exact. According to the saga-writer (ch. 31), his first poem marks the moment when he first went against his father's wishes. Skallagrim had refused to allow Egil to attend a feast being given by Yngvar, Skallagrim's father-in-law and Egil's grandfather. "You're not going," said Skallagrim. "You don't know how to behave yourself when there's company gathered and a lot of drinking going on. You're difficult enough to cope with when you're sober" (this to a child of three!). So Egil found himself a horse and rode to the feast where he was delightedly greeted by Yngvar. This inspired a poem, in which he praises Yngvar for his generosity as a host (a much valued quality) and himself for being the most brilliant three-year-old poet around. His father must have been furious, but the saga writer doesn't elaborate. We next hear of Egil's ambitions when he was 6 (ch. 40), in a verse that looks directly towards his career as a Viking. According to the saga writer, he had been playing in a ball game against Grim, a boy of 10 or 11. Grim had been winning. Egil furiously struck Grim with his bat. Grim threw Egil to the ground and the other children started laughing. Egil found an ax and killed Grim--even as children, these are people who wanted their respect. The two households came to blows, and seven men were killed. When Egil returned home his father was not pleased, but his mother proudly declared Egil had the makings of a real Viking in him. The young Egil's poem--presented in the original Old Norse--describes his vision of a Viking's life. Egil responded with a verse that has become a classic expression of the "Viking mentality." Already by the age of 6 Egil has defined the tough-guy part of himself. And if it wasn't in fact his mother who encouraged his ambitions, we can assume such ambitions were in the air. I like to think of sweet little Egil being regularly regaled with stories of Vikings during the long dark Icelandic winters. 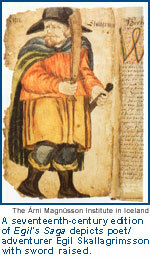 Egil urges his comrades to do "a courageous deed" and make "the ugly music of spears." That Egil lived up to his early tough-guy promise is evidenced both by the saga writer and by his own verses. In one of the incidents connected with King Eirik Bloodaxe, for example, he prides himself for having hacked and hurled a trio of trusty royal servants down to Hell eternal (ch. 45). He delights in launching the rites of the battle song when an opportunity to plunder in Lund arises (ch. 47). He also leaves us plenty more in this vein. When he tries to make himself attractive to women, for example, it is by boasting of how he made the barns blaze (ch. 48). He prides himself on killing a miser (ch. 57), on killing Queen Gunnhild's young son (ch. 57), on how he would kill a troublesome berserk ("I'll hack him down when I'm ready;/ . . . No mercy from the poet" ch. 64), on how he twice took on 11 men by himself ("I carved the wolf's carrion/And killed them all" ch. 78), on how he was rewarded by one king and got the better of another ("The prince has praised me/With precious gold,/The wild king once/Was tamed by my words" ch. 85). He describes how he used his teeth to tear out the throat of a certain Atli ("My teeth solved my troubles/And tore out his throat" ch. 65), and how he vomited all over a certain Armod ("Many a guest's gift/Is even more gushing;/Now the ale has ended up/All over Armod" ch. 71). Later he gouged out Armod's eye with his finger, leaving it hanging on his cheek (ch. 72). And so on. Egil confirms that the Vikings wanted to present themselves much as they were remembered by those they traumatized. But they also wanted to be remembered for other things, too. This is where our picture begins to get complex and therefore interesting. King Eirik sat bolt upright, his eyes fixed on Egil while he recited his poem. When it was finished the King spoke. And blow in the wind. Long may my words live. (ch. 78) But Egil's most moving poem is in remembrance of his sons, one of whom had died, the other and more beloved of whom had been drowned. More than any other work, it takes us into the mind of one of the Viking Age's most paradigmatic characters. The story of the poem's composition (ch. 78) is well worth telling; clearly, it is one of the "Egil stories" that must have been in circulation already before Egil's death. When his drowned son's body was washed up, Egil laid it in Skallagrim's mound. He then locked himself in his bed-closet, refusing to eat or drink, fully intending to die. On the third day his wife summoned their daughter, Thorgerd. She arrives, and asks her father to let her into the bed-closet because she wants to go the same road as he. He lets her in. She is chewing something. He asks her what it is. "Seaweed." "Is it bad for you?" he asks. "Terrible," she replies, asking him if he would like to try some. "What would be the use?" he responds. She gets thirsty. "That's just what you would expect to happen if you go round eating seaweed," he says. She calls for water, and when it comes she asks him if he would like to have some. He grabs the drinking horn and drinks great gulps--of milk. "We've been tricked," says she. He bites off the bottom of the horn and throws it down. "What shall we do now, father," she asks, "now our plan has failed? Perhaps you should compose a poem in honor of your son--it is, after all, his only chance of being remembered. Why not do this and then we can still die if we want to?" Can hold out no hope. But with a man's heart. "As the poem progressed," the saga writer then tells us, "Egil began to get back his spirits." He tried the poem out on his wife and household--and lived to a ripe old age. There is so much more I could say about Egil's wonderful and wonderfully drawn character--that he was a healer (ch. 72), that he was sensitive to the beauties of nature (ch. 57), that he suffered for love (ch. 56--Egil in love?). But I will have to leave such further discovery to you. You will find in Egil, I believe, someone who illustrates better than any other the strange combination of ferocity and artistry that the Vikings themselves saw as their legacy. Christina von Nolcken studied in England at Oxford University, where she specialized in Medieval English Language and Literature. After teaching for three years at St. Anne's College, Oxford, she moved to the University of Chicago where she is associate professor in the Department of English and the College and chair of the Committee on Medieval Studies. She regularly teaches courses on Old and Middle English language and literature and the history of the English language. Most of her writing has been on texts prepared by the followers of John Wyclif (d. 1384) as part of their program to bring education, and especially religious education, to the people. COPYRIGHT | A version of this article was delivered as a lecture at the October 2000 Humanities Open House at the University of Chicago. Copyright 2001 The University of Chicago.